I know, I know, it’s been too long. But life with a 4 month old doesn’t particularly lend itself to blogging quite often, you know? A bunch of us went to Anis for the lovely Hakeber’s birthday celebration, and in turn I was introduced to the best moules frites I’ve ever tasted. 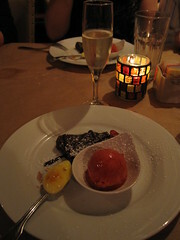 Kudos to knowing the chef, too, as we were treated with sinfully yummy desserts and even more champagne that I had already indulged in. Hey, mommies need nights out, too! Thanks for coming! Glad you had a good time!